Kitchen Pumps from Saniflo ..
Saniflo’s best-selling product of 2018 was the Sanivite + grey water waste pump. Given that the company is best known for inventing the macerator – and has subsequently become the generic name for that product – it is perhaps surprising that the Sanivite+ outsells every other product in the range. Plumbers and installers, however, understand the reason for its popularity. Useful in a wide variety of situations the main function of the Sanivite + is to remove waste water from a sink in a domestic kitchen. 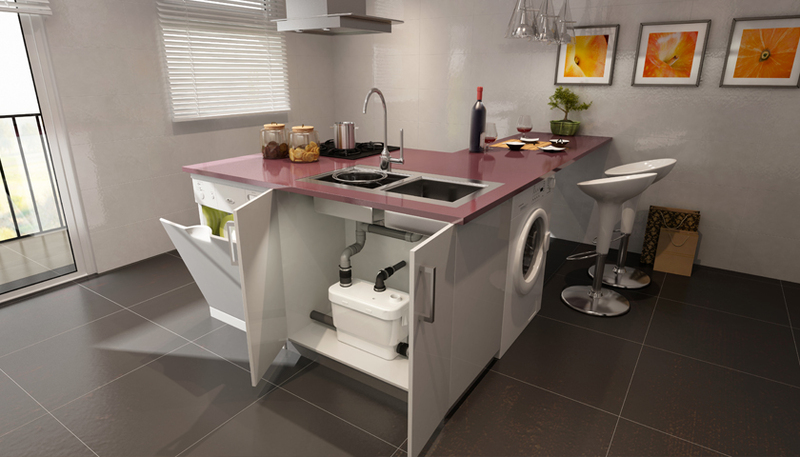 With the trend of a central island in the kitchen it is often the case that gravity drainage won’t be near enough to take the waste. In this case the Sanivite + can be installed under a sink and out of sight behind a cupboard door. Water is pumped out via 32mm discharge pipe up to 6m vertically or 60m horizontally. With four inlets it can be connected to multiple appliances and can handle hot soapy water up to 60°C. It is powered by a quiet but powerful pump. The Sanivite + can be used to transform redundant spaces into working areas without the need for costly civils work. Whether it’s an additional kitchen, a utility room, laundry room and even for use with a wine fridge or icemaker the small, yet productive unit is certainly making its mark.